Support Indiana Geeking on Ko-fi.com! - Ko-fi ❤️ Where creators get paid by fans, with a 'Buy Me a Coffee' button. Hey there! 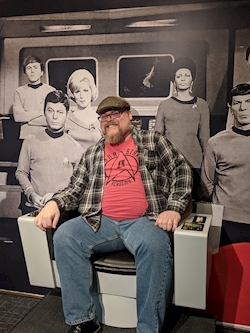 I'm a local blogger & podcaster out of Indianapolis, IN that has been talking about cool things for Geeks in this state since 2010. I currently host a website, focusing on events and Geek shops in the state of Indiana, I run a podcast where I interview local creators, and I host/edit two other podcasts for friends! All of this on top of being active on social media, and spending time with my family and friends. I am also a fan of Star Trek, Star Wars, Ghostbusters, and a ton of other pop culture, science fiction, and fantasy properties. Right now, I'm just looking to be able to make the bills for the blog, the Indiana Geeking Podcast, the Social Sci-Fi Podcast, and take over billing for the You're Gonna Love This... or Not... Podcast. Ko-fi helps supplement the income from Patreon and donations! THANK YOU ALL! Secured Payments. Support goes to Indiana Geeking's account.